Get your message out to shoppers with eye-catching and practical labels and tags for your retail location. Jet Label is the ultimate solution for all retail labels because of our in-house experts on thermal print technology, the Jet Marking Systems team. With experience with the biggest names in retail, we guarantee your satisfaction whether you order shelf talkers, coupons, scale labels, promotional stickers, or even thermal printing equipment like ribbons, ink and printers. At Jet Marking Systems, our team partners with the best manufacturers of thermal printers, barcode scanners, label applicators and more. We produce it all – from shelf talkers to coupons, from scale labels to attention-getters. Not only that, but we stock scale-manufacturer approved material and house the largest ready-made inventory in Western Canada. Along with the best freezer adhesion in the industry, we also have the ability to print up to 16 colours including colour borders on box labels. 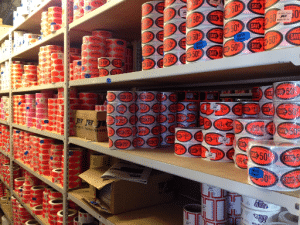 With our subsidiary company, Jet Marking Systems, we offer a full solution for marking your products for inventory. We’ve partnered with the best manufacturers in the world to provide you with scanning solutions, desktop thermal printers, label applicators, RFID and more for all your coding and tracking/traceability requirements. ATTENTION GROCERY INDUSTRY: UPDATE YOUR NUTRITION FACTS TABLE TODAY! We want you to have the best worry-free experience while using our thermal printer products. If you buy thermal print ribbon from us, and within 4 million linear inches or 365 days of use you’ve noticed damage to your thermal printhead, we will replace your printhead for FREE. Read all the details here. Why isn’t my tape sticking?